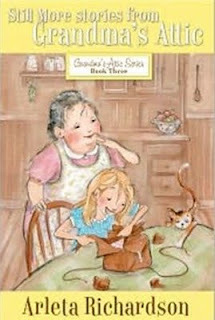 Some of you may recall our review of a pair of delightful young reader’s books, In Grandma’s Attic and its companion More Stories from Grandma’s Attic. In both of them, author Arleta Richardson shares stories her grandmother told her about how things were when she grew up…in the good old days. Originally released in the 1970’s, Richardson’s wholesome and entertaining tales have enchanted over two million readers worldwide. Now this timeless series has been revised and re-released with all new artwork giving another generation of girls the opportunity to read and enjoy these marvelous tales. Tales that transport the reader to a time when things moved slower, life was simpler, and family was close by and treasured. You may also recall my mention of further volumes to come. Well, today I have some good news to share. Two more books in the series were re-released the first of this month. Today we’re looking at the third volume, Still More Stories from Grandma’s Attic. Children love the captivating stories that recount childhood memories of mischief and joy. I encourage you to find a comfortable chair, gather the kids or grandkids around you and take a trip back into yesteryear with Arleta Richardson and her Grandma, Mabel. She’s a natural born storyteller and these short, but heartwarming tales, are sure to bring a smile to every child’s face. I had an opportunity to test one of the books when my eight-year-old granddaughter visited this summer. I was interested in seeing whether she could read them by herself. She’s a big fan of the Little House TV series and I wanted to see how she reacted to Stories from the Attic. I can happily report success on both counts. She had no trouble reading them…although she also liked having Grandpa read them at bedtime. Since the stories are short, he was happy to comply. She enjoyed the book and hinted it would be nice to find some more under the tree this Christmas. In a few days we’ll look at the fourth volume Treasures from Grandma’s Attic. We thank Audra Jennings of B&B Media for providing us with the opportunity to review these books.